Free Play’s innovative playground modules challenge kids to think and play beyond the normal playground set-up with abstract structures that invite open-ended creative engagement. 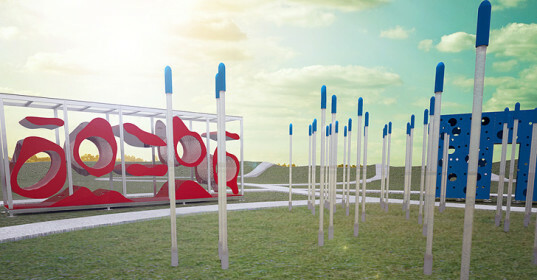 The sensory-focused structures encourage make believe, letting kids create their own environment. Rather than typical swings and slides, the brightly colored Free Play structures inspire a child’s intellectual, social and physical development. Read on for more details about each of these alternative, innovative designs that we'd love to see popping up at a park near us! Free Play’s creator, Dan Schreibman, was inspired to create an abstract playground after bringing his children to a Richard Serra sculptural exhibition. The soaring Cor-ten steel sculptures delighted Schreibman’s two little girls and got him thinking about an alternative to the traditional slides, swings and monkey bars in his local playground. Schreibman hired New York based LTL Architects to create four alternative playground pieces, each clad in bold primary colors. LTL came up with four models: The Maze, The Cornfield, The Weeping Willow and The Ant Farm. The Maze is a bright blue modified monkey bar structure, complete with climbable walls, cubes, and circular cut outs made from durable polyethylene. The Corn Field is a grouping of soft vertical stalks that bend and contort upon contact. The whimsical stalks can also illuminate at night with LED lights, creating a mystical field to run through. The Weeping Willow is a network of hanging ropes that are affixed to a steel frame. Children can run through the dense ropes, climb or swing on them. The ropes can also be replaced with chimes for a musical experience. The last model is The Ant Farm, a piece that can be used indoors or out. The clear polycarbonate structure is made up of red organic shaped tubes that can be climbed in, on or through. The alternative to mundane playgrounds, Free Play challenges kids to rethink how they play, encouraging creativity and exploration. Free Play’s creator, Dan Schreibman, was inspired to create an abstract playground after bringing his children to a Richard Serra sculptural exhibition. The soaring Cor-ten steel sculptures delighted Schreibman’s two little girls, and got him thinking about an alternative to the traditional slides, swings and monkey bars in his local playground. Schreibman hired New York based LTL Architects to create four alternative playground pieces, each clad in bold primary colors. LTL came up with four models- The Maze, The Cornfield, The Weeping Willow and The Ant Farm. The Maze is a bright blue modified monkey bar structure, complete with climbable walls, cubes, and circular cut outs made from durable polyethylene. The Corn Field is a grouping of soft vertical stalks that bend and contort upon contact. The whimsical stalks can also illuminate at night with LED lights, creating a mystical field to run through. The Weeping Willow is a network of hanging ropes that are affixed to a steel frame. Children can run through the dense ropes, climb or swing on them. The ropes can also be replaced with chimes for a musical experience. The last model is The Ant Farm, a piece that can be used indoors or out. The clear polycarbonate structure is made up of red organic shaped tubes that can be climbed in, on or through.